A novel terbium-mercury compound [Tb(IA)3(H2O)2(Hg2Cl4)]n·nHgCl2·nH2O (1, HIA = isonicotinic acid) was prepared via a hydrothermal reaction and structurally characterized through single-crystal X-ray diffraction technique. This compound is characterized by a three-dimensional (3-D) framework. Photoluminescence experiments with solid-state samples uncovered that this compound can show yellow light emission with the emission peaks at 490, 545, 586 and 621 nm, respectively. These photoluminescence emission peaks are originated from the characteristic emission of the 4f electrons intrashell transition of the 5D4 → 7FJ(J = 6, 5, 4, 3) of the Tb3+ ions. An energy transfer mechanism is expatiated by applying the energy level figure of the terbiumions and isonicotinic acid. This compound possesses a remarkable CIE chromaticity coordinates (0.3525, 0.4032). 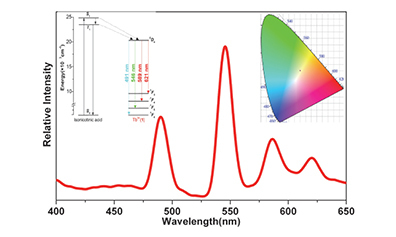 A wide optical band gap of 2.51 eV of the title compound is determined by using the solid-state UV/Vis diffuse reflectance spectroscopy.